Udaipur : Mostly include young women, at least, 18 people were killed in a road accident near Dholapani area of Choti sadri in Pratapgarh district of Udaipur division in Rajasthan. While nearly 25 people were injured when a pick-up jeep collided with a stationary truck, which took place in Dholapani area of the district on Saturday evening. 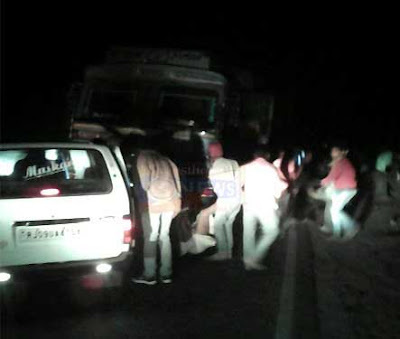 According to police officials the incident occurred area around 7pm on Saturday, when a pick-up carrying some labourers from surrounding villages collided with a standing truck from behind and overturned. Villagers reached the spot and started the rescue operations before the police arrived. Six were killed on the spot and four people died on the way to hospital. The injured have been admitted to MB hospital in Udaipur. There were about 38 people, most in their twenties, in the pick-up jeep. It was overcrowded. These labourers are fetched from their villages for labour work at Chhoti Sadari in the morning and dropped home in the evening. Chief Minister Vasundhara Raje has announced an ex-gratia of Rs 50,000 each for the next of the kin of the killed. The CM also announced a financial assistance of Rs 25,000 each for critically injured and Rs 2,500 each for other injured in the accident.